That is the question and I’ll start right off by saying cotton tees are presently the most budget friendly shirts. So if you bottom line is cost, then let’s just get this out of the right right here at the beginning, cotton shirts are the way to go and there is absolutely nothing wrong with that and you would be in the majority. Now that we got that out of the way let’s look at things like value, performance, and general use for your custom t-shirts. Cotton is a little different than it was 10 years or longer because now companies offer their shirts in a “preshrunk” cotton which means while you still get some shrinkage, it’s down to 3-4 percent compared to what used to be an automatic 10 percent. However, depending on your laundry habits the 3-4 percent is not set in stone. Cotton is the most cost effective material out there for custom t-shirts and it’s the majority of what our customers buy. It’s a cost conscious choice and it still appeals to a broad audience. Now days companies are offering more ringspun options for softness and cotton polyester blends for comfort as well. Regarding the screen printing aspect cotton is where it began and continues to remain. All inks for every day use by screen printers are generally formualated for cotton. Inks not meant for cotton are inks that had to be specially formulated from the norm. In regards to marketability and general use, cotton is still the major player because it makes a great cost effective options for kids going on a field trip, selling your created brand shirts, company shirts, team sports shirts, and really whatever your need for custom t-shirts would be, cotton would be suffice. 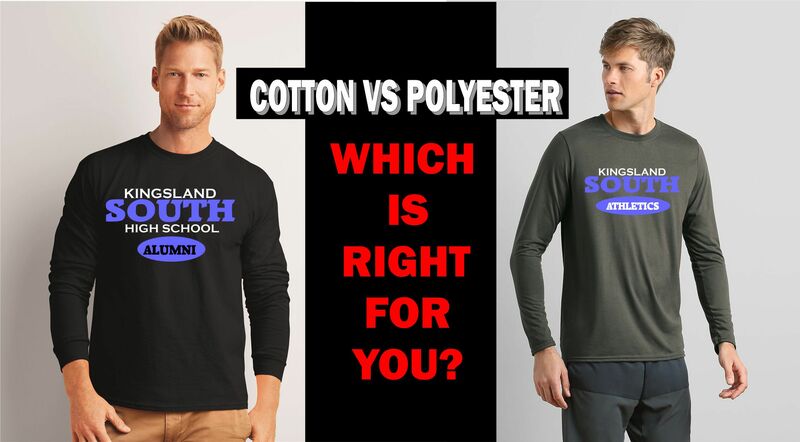 In recent years as the trend has gone to lighter softer more tapered custom tees, a lot of cotton blends have gained in popularity with the ringspun cotton by itself, cotton poly blends as well as cotton poly rayon blends. These shirts have a higher price point and are a significant option depending on you marketing plan. Polyester is a performance fabric which means it takes the moisture or sweat your body creates and speeds up the evaporation process leaving you with a dryer shirt when you are sweating. This technology is real and why the demand for poly shirts has gained traction. They are very soft in their own right and their performance properties make them a great option for team sports, a classy professional look, and when outdoors when temperatures are hot. There are people on both sides of the cotton poly fence. Most people like both while others either love one and disregard the other. The cotton versus polyester custom t shirts will always remain an option that has opponents and proponates. Kirkwood Trading Company can look at your specific need for custom t shirts and give you options and make recommendations. Contact us for a free price quote through our home page. We can assist in design, color combinations and making sure you custom tees are perfect.